8000 Btu cooling and 3850 Btu heating 115v room air conditioner with electric heat. Chill’s design is cool, sleek in designer white. And it’s lighter weight so it’s easier to lift and install. Programmable Timer A 24-hour programmable timer lets you preset an on and an off time. Auto Air Sweep Swings louvers left to right for more even air distribution throughout the room. Energy Management The Money Saver setting turns the fan off with the compressor to use less energy. Comfort Three cooling speeds plus a fan only setting. Safety & Security EntryGard anti-intrusion protection protects against kick-in intrusion. Filtration Washable antibacterial air filter. 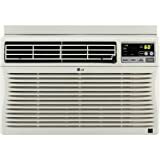 8000 Btu cooling and 3850 Btu heating Chill+ room air conditioner with electric heat has an EER of 9.8 and installs in a window or through walls up to 8" deep and conditions rooms up to approximately 350 sq ft.
9800 Btu Uni-Fit universal fit thru-the-wall room air conditioner has an EER of 9.4 and installs through walls up to 16 1/4" deep to condition rooms up to approximately 400 sq ft.
9700 Btu 115v WallMaster® through-the-wall room air conditioner. Attractive Outside Mounts flush with exterior wall. Fits Fedders A&B Sleeves Easily replaces existing product (Fedders B sleeve requires BAK accessory kit) Ships with inner and outer weather panel. WallMaster sleeve sold separately. Commercial Grade Quality Robust materials and components. EntryGard™ anti-intrusion protection secures chasis to sleeve. Impact resistant front cover. 24-hour timer. Energy Management Money Saver setting turns the fan off with the compressor to use less energy. Comfort Three cooling speeds plus a fan only setting. Safety & Security EntryGard anti-intrusion protection protects against kick-in intrusion. Filtration Washable antibacterial air filter. 9700 Btu commercial grade WallMaster thru-the-wall room air conditioner has an EER of 9.4 and installs through walls up to 15 5/16" deep to condition rooms up to approximately 400 sq ft.
7600 Btu cooling and 4000 Btu heating commercial grade Kühl+ room air conditioner with electric heat installs in a window or through walls up to 8 1/2" deep and conditions rooms up to approximately 300 sq ft.
Chill, Friedrich s premium line of window air conditioners, has many of the features you ll find on our ultra premium K hl line, but without the premium price. Because it s a Friedrich, the quality and durability come standard. Most models are ENERGY STAR rated and have energy-management options like a programmable timer and a Money Saver setting. Choose from a full range of cooling capacities that will keep you comfortable in any space. 5,450 Btu Chill room air conditioner installs in a window (not for thru-the -wall installations) and conditions rooms up to approximately 150 sq. 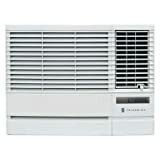 ft.
12000 Btu115v room air conditioner. Chill’s design is cool, sleek in designer white. And it’s lighter weight so it’s easier to lift and install. Programmable Timer A 24-hour programmable timer lets you preset an on and an off time. Auto Air Sweep Swings louvers left to right for more even air distribution throughout the room. Energy Management The Money Saver setting turns the fan off with the compressor to use less energy. Comfort Three cooling speeds plus a fan only setting. Safety & Security EntryGard anti-intrusion protection protects against kick-in intrusion. Filtration Washable antibacterial air filter. 12000 Btu Chill room air conditioner installs in a window or through walls up to 8" deep and conditions rooms up to approximately 550 sq ft. This Garrison portable air conditioner uses eco-friendly R-410A refrigerant to cool rooms measuring 400 to 450 sq. ft. It also includes hardware for easier installation, as well as a remote control for more convenient cooling.^^Specifications|Cooling Performance (BTU/HR): 10,000|EER: 9.0|Voltage: 115 VAC|Dehumidification Rate (Pt/Hr): 2.3|Height: 27-5/8 IN |Width: 13-1/2 IN|Depth: 14 IN|Weight: 53 Lbs|NEMA Plug Configuration: 5-15P^^Eco-Friendly^Using this air conditioner is better for the environment. It meets UL-US and cUL certification standards.^^Warranty Information^Included with this air conditioner are 2 limited warranties. There is a 1-year limited warranty on the entire unit and a 5-year limited warranty on the unit's sealed system.